Midsummer, magical time. The daylight is beautiful, I love the way it turns pink just before dusk. I glance out at the garden and its as though I really am wearing "rose coloured spectacles". 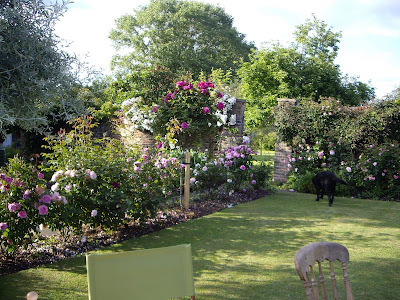 Midsummer is peak rose season, my house is swathed and cloaked in roses, the fragrance wafts up towards our bedroom window on sultry evenings just as I hoped it would when we planted Madame Alfred Carriere (sorry for the spelling.) I first saw it at Sissinghurst and thought my heart would burst it's seams with joy, it literally was dripping with creamy white blooms. As Elvis Costello once said......"its been a good year for the roses" and really it has! And that rather neatly brings me on to Shakespeare...................Peaseblossom, Cobweb,Moth and Mustardseed. I came to them through reading Noel Streatfield's Ballet Shoes and then later, a Midsummer Nights Dream. Do you suppose they will be busy in an enchanted forest tomorrow night? In my Mother in Law's garden (I call her MIL) she has created this gorgeous rose walk. It looks amazing doesn't it? When the weather is kind we sit outside at every opportunity just to savour the roses. PIL (Father in Law or Pete in Law) adored his David Austin roses. Being Fathers day tomorrow my thoughts turn to him and all the other "Dad's" in my life. There are lots, some related some not, its not that important as I love them all for everything they have ever been and will be to me. Midsummer also spells the beginning of what seems like endless carefree summer days stretching ahead. 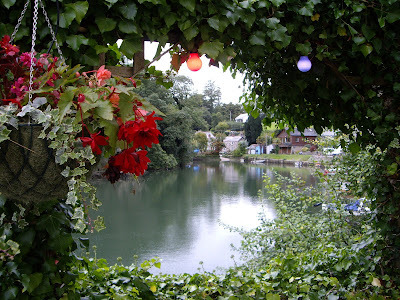 Holidays in favourite places, messing about in boats, catching up with friends with a G&T in hand. Sometimes it feels like these moments get frozen in time and will never end, but of course they always do. 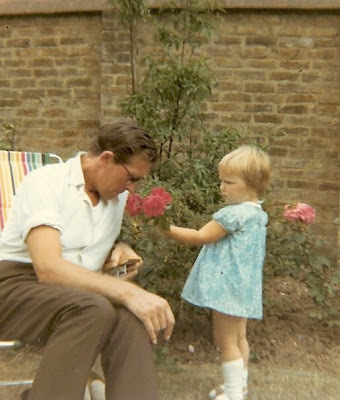 Whenever I see this picture I am immediately transported back in time to my Grandparents garden. I can vividly smell Grandad's tomatoes in his wonderful lean-to greenhouse which was painted a wonderful peppermint green! And here I am, very seriously presenting these amazing roses to my Grandad. Roses for Father's Day, no wonder I love them so. And Dad these jolly picotees are for you Happy Birthday too.